For the song by Scouting for Girls, see This Ain't a Love Song (Scouting for Girls song). (1994) "This Ain't a Love Song"
(1995) "Something for the Pain"
“This Ain’t a Love Song” is the lead single from Bon Jovi’s 1995 album These Days. It reached number 14 on the US Billboard Hot 100, number two on the Canadian RPM Top Singles chart, number six on the UK Singles Chart, and number one on the Finnish Singles Chart. The song is an example of the strong rhythm and blues influence that Jon Bon Jovi and Richie Sambora wanted the These Days album to have, and the final result by the Q is alternative rock according to the critics of the magazine. The official music video was shot at Wat Ratchaburana in Ayuthaya, Thailand; and directed by Andy Morahan. A Spanish version, "Como Yo Nadie Te Ha Amado," was also recorded, however the Spanish version is different from the original because the lyrics are different and it talks about how nobody really love the two people that are in a relationship. Mexican singer Yuridia covered the Spanish version on her second studio album Habla El Corazón which peaked at number 16 on the Billboard Hot Latin Songs chart. Yuridia's cover received was nominated at the 2008 Latin Billboard Awards for Latin Pop Airplay of the Year by a Female Artist. Her cover also led to Jon Bon Jovi winning an ASCAP Latin Award in the Pop/Ballad field. ^ Garcia, Alex S. "mvdbase.com - Bon Jovi - "This ain't a love song"". Music Video DataBase. Retrieved November 4, 2015. ^ "Yuridia - Awards". AllMusic. Rovi Corporation. Retrieved May 29, 2015. ^ "Finalistas a los premios Latin Billboard". El Nuevo Heraldo (in Spanish). February 6, 2008. Retrieved June 8, 2017. ^ "16th Annual Latin Music Awards". American Society of Composers, Authors and Publishers. May 16, 2008. Retrieved August 10, 2015. ^ "Australian-charts.com – Bon Jovi – This Ain't a Love Song". ARIA Top 50 Singles. Retrieved November 3, 2012. ^ "Austriancharts.at – Bon Jovi – This Ain't a Love Song" (in German). Ö3 Austria Top 40. Retrieved November 3, 2012. ^ "Ultratop.be – Bon Jovi – This Ain't a Love Song" (in Dutch). Ultratop 50. Retrieved November 3, 2012. ^ "Ultratop.be – Bon Jovi – This Ain't a Love Song" (in French). Ultratop 50. Retrieved November 3, 2012. ^ "Top RPM Singles: Issue 8537." RPM. Library and Archives Canada. Retrieved May 11, 2016. ^ "Top RPM Adult Contemporary: Issue 2723." RPM. Library and Archives Canada. Retrieved October 22, 2018. ^ "Lescharts.com – Bon Jovi – This Ain't a Love Song" (in French). Les classement single. Retrieved November 3, 2012. ^ "Offiziellecharts.de – Bon Jovi – This Ain't a Love Song". GfK Entertainment Charts. Retrieved October 19, 2018. ^ "The Irish Charts – Search Results – This Ain't a Love Song". Irish Singles Chart. Retrieved October 22, 2018. ^ "Indice per Interprete:" (in Italian). Hit Parade Italia. Retrieved October 22, 2018. ^ "Nederlandse Top 40 – week 26, 1995" (in Dutch). Dutch Top 40 Retrieved October 22, 2018. ^ "Dutchcharts.nl – Bon Jovi – This Ain't a Love Song" (in Dutch). Single Top 100. Retrieved November 3, 2012. ^ "Charts.nz – Bon Jovi – This Ain't a Love Song". Top 40 Singles. Retrieved November 3, 2012. ^ "Norwegiancharts.com – Bon Jovi – This Ain't a Love Song". VG-lista. Retrieved November 3, 2012. ^ "Notowanie nr706" (in Polish). LP3. August 11, 1995. Retrieved March 17, 2019. ^ "Official Scottish Singles Sales Chart Top 100". Official Charts Company. Retrieved October 21, 2016. ^ "Swedishcharts.com – Bon Jovi – This Ain't a Love Song". Singles Top 100. Retrieved November 3, 2012. ^ "Swisscharts.com – Bon Jovi – This Ain't a Love Song". Swiss Singles Chart. Retrieved November 3, 2012. ^ "Official Singles Chart Top 100". Official Charts Company. Retrieved November 3, 2012. ^ "Bon Jovi Chart History (Hot 100)". Billboard. Retrieved November 3, 2012. ^ "Bon Jovi Chart History (Adult Contemporary)". Billboard. Retrieved November 3, 2012. ^ "Bon Jovi Chart History (Pop Songs)". Billboard. Retrieved November 3, 2012. 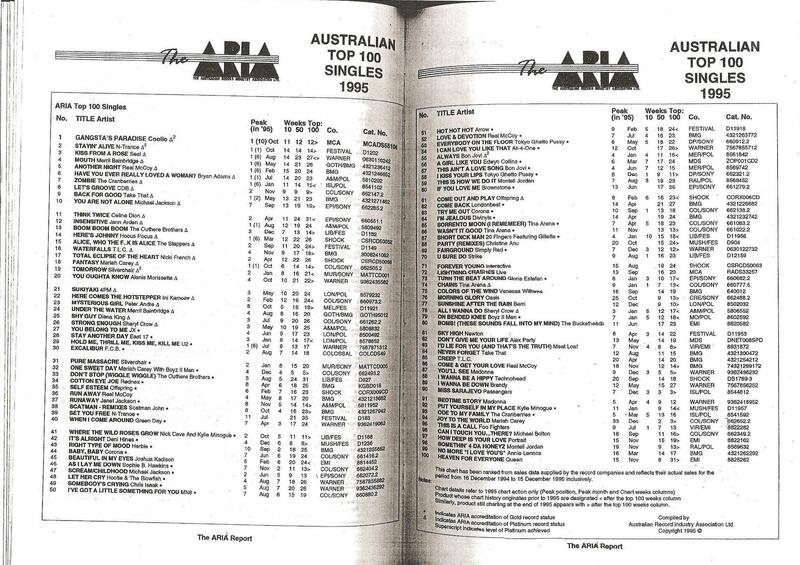 ^ a b "The ARIA Australian Top 100 Singles 1995". ARIA. Retrieved January 27, 2019. ^ "Jahreshitparade Singles 1995" (in German). Retrieved March 17, 2019. ^ "Jaaroverzichten 1995" (in Dutch). Ultratop. Retrieved March 17, 2019. ^ "Rapports annuels 1995" (in French). Ultratop. Retrieved March 17, 2019. ^ "RPM Top 100 Adult Contemporary Tracks of 1995". RPM. Library and Archives Canada. Retrieved October 22, 2018. ^ "Classement Singles - année 1995" (in French). SNEP. Archived from the original on February 14, 2009. Retrieved March 17, 2019. ^ "Top 100 Singles - Jahrescharts 1995" (in German). GfK Entertainment. Retrieved March 17, 2019. ^ "Jaaroverzichten - Single 1995" (in Dutch). MegaCharts. Retrieved March 17, 2019. ^ "Schweizer Jahreshitparade 1995" (in German). Retrieved March 17, 2019. ^ "Billboard Top 100 - 1995". Retrieved August 27, 2010.